Real-time marketing is a process that enables marketers to capitalize on real-time events and deliver a relevant message to the right person at the right time. Ideas must be developed in minutes rather than days or weeks. And messaging centers around real-time feedback from customers or around current events that happen. The benefit of this type of marketing, is that you can capitalize on trending topics that your followers can relate to. 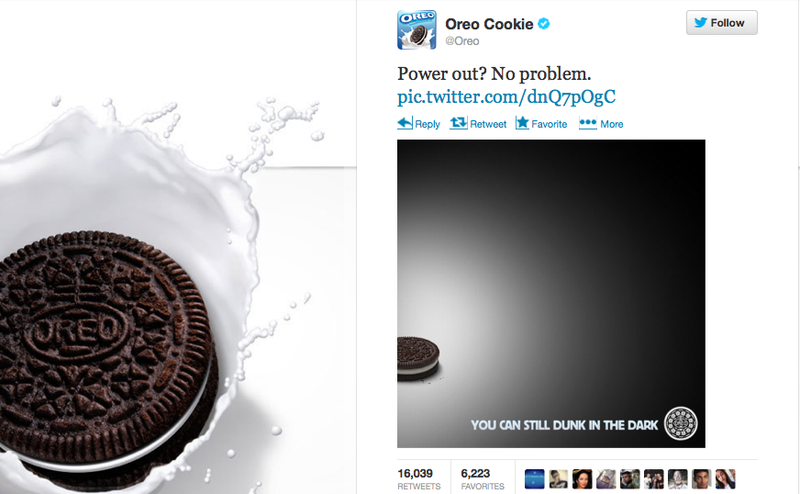 Take Oreo’s “you can still dunk in the dark” real-time campaign for example. Within mere minutes of the power going out, Oreo had posted a photo of an illuminated Oreo cookie (seen below) that took the social media world by storm. The tweet was during the Superbowl power outage and was retweeted just under 15,000 times and increased their Twitter following by 8,000. They also posted to Facebook, leading to over 19,000 likes and boosting their Instagram followers from 2000 to 36,000 along with over 16,000 pictures submitted. 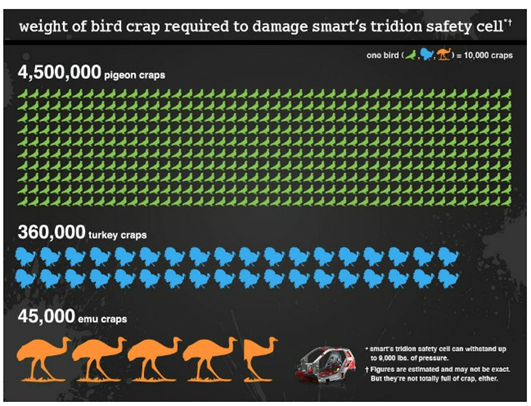 Smart Car struck it big when they took advantage of a tweet that read “Saw a bird had crapped on a Smart Car. Totaled it.” The folks who run social at Smart Car put together a quick but hilarious infographic response that read “Couldn’t have been one bird,@adtothebone. Sounds more like 4.5 million. (Seriously, we did the math. )” This resulted in over 500 new followers on Twitter and became favorited over 500 times! They also drove their engagement rate through the roof with avid tweeters and listeners across Twitter and the social media world. These opportunistic real-time strikes by brands show they are listening and on-the-ball, while allowing them to be edgy and fresh. The challenge marketers are facing is how to spread real-time marketing to more traditional forms of media like television. Jay Baer points to 17 examples of Brands and their Tweets that completely missed the mark at this year’s Oscar’s, which attempted to replicate Oreo’s success by capitalizing on a highly publicized event. Clearly, the success of real-time marketing is still up for debate. However, no one can discount that it is a breath of fresh air to consumers who have been longing for relevant messages that make sense to them when they receive it. Consumers now more than ever, have developed expectations for responsiveness, participation and relevance of messaging on social media channels. 42% of consumers believe brands should respond to their questions or concerns within an hour on any given day, including weekends. As an example, AARP has a team dedicated to real-time marketing. 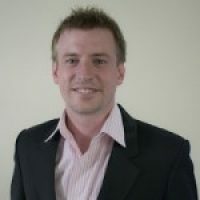 The team regularly appoints a rotating member as the “engagement lead”, and their role is spotting and engaging in real-time marketing opportunities. Someone is also tasked each night with live tweeting to communities of a major event. They have live-tweeted and captured audience attention at everything from Dancing with the Stars to the NBA All-Star Game, the Super Bowl, and the Oscars. Regardless of some early failures, expect brands to see the potential and ramp up their marketing spend in responsiveness and real-time marketing. It could be like riding a bike; you might fall a few times but then you get it right. Keep your eye on brands like Heineken, who have committed and announced their intention to leverage their global tie-ups with Google and Facebook to develop real-time marketing initiatives around mobile devices as the brewer looks to capitalize on fans who are watching sponsored events such as Champions League soccer matches and push messaging through mobile apps. What are you doing to capitalize on real-time marketing?